Lock in a great price for Hotel Magenta – rated 8.7 by recent guests! Large and clean room with a comfy bed. The breakfast was decent and it's just 20 minutes walking from the city center and 15 minutes from the train station. You can leave your luggage if you want to visit the city before/after your stay. Quiet area, not far from the tourist places and train station SMN. Decent breakfast. A great value. Wonderful staff. Good selections for breakfast. The hotel was exactly what we needed for a one night stay after getting in from the airport. The front desk agent made a wonderful dinner recommendation. Breakfast in the morning was better than we imagined. The reception staff were outstanding. I was offered beautiful coffee whenever I was just waiting in reception and they gave me good detailed tips on navigating Florence. It was a pleasure to stay there. Hotel Magenta This rating is a reflection of how the property compares to the industry standard when it comes to price, facilities and services available. It's based on a self-evaluation by the property. Use this rating to help choose your stay! One of our top picks in Florence.Magenta is a family-run hotel in a pleasant neighborhood of Florence, 10 minutes' walk from Santa Maria Novella Train Station. It offers modernized rooms with air conditioning and a TV. Rooms have a minimalist design and include a mini-bar and private bathroom with toiletries. Hairdryers and safety deposit boxes are available from reception. An Italian breakfast is served each morning in the breakfast room near reception. You will also find a bar and a 24-hour reception with luggage storage. Hotel Magenta is set in a building that dates back to the early 1900s. In the historic neighborhood you will find a number of popular trattorias and small restaurants. Ponte Amerigo Vespucci, a bridge over the River Arno, is just 650 feet away. When would you like to stay at Hotel Magenta? This modern room features free Wi-Fi, air conditioning, and a private bathroom with a hairdryer and toiletries. This modern and larger room features free Wi-Fi, air conditioning, and a private bathroom with toiletries. This spacious and modern room features free Wi-Fi, air conditioning, and a private bathroom with toiletries. 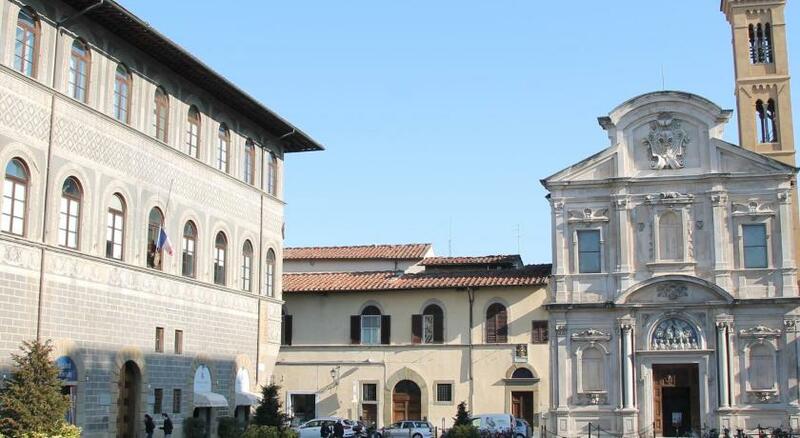 Our building, renewed in 2011 was originally the famous "Pensione Pagnini", one of the best in Florence. Today we still have a lot of people coming back in Florence after many years that stayed at Pensione Pagnini that came to us and still have awesome memories of their stay here, a pride for any Hotel Keeper. Our new family management wants to try to carry on this tradition, and also if today there is much more competition in hospitality and the historical period is not one of the best we hope that with our efforts we will leave in our guests mind beautiful memories of their stay in our Hotel as well as the awesome Florence. House Rules Hotel Magenta takes special requests – add in the next step! ATM card Cash Hotel Magenta accepts these cards and reserves the right to temporarily hold an amount prior to arrival. Hotel Magenta accepts these cards and reserves the right to temporarily hold an amount prior to arrival. The rooms are very clean and has everything you need! the staff is very very kind. The breakfast is very tasty!!! The position is perfect,5 minutes from station,8 minutes from center!! I really recommend you this hotel!!! Wonderful hotel!!!!!! Very quiet and comfortable! I will recommend this hotel. Everything in this hotel was Excellent! Florence is best toured by foot but still train station was nearby. The room was pretty good for a couple with all required ameneties. The staff also arranged an adaptor for us since our chargers were different. The breakfast was delicious and healthy at the same time. All in all we loved our stay and would genuinely recommend it to others. The people that are working here are really friendly and are sharing a positive vibe. The location is placed in a very very good place, at maximum 15 min from the centre. The breakfast is light but you don’t need more. Regarding the room, was very clean and comfortable. I really enjoyed staying here! We did not have a view and we did not have a safe in the room! Goog B&B&location.Clean hotel and breakfast is acceptable. Everything was perfect. Staff, breakfast, location. there was a terrible smell! The walls were extremely thin, could hear my neighbor every time he took a shower! Not much natural day light as the windows in my room looked out onto other balconies and a quad area. There were workmen working on my first morning at 8.45am which I didn't appreciate! Liked the price, although be aware there is an added room tax per person! The location was just off the beaten track, but withing walking distance of everything. Breakfast was good considering it was self service, much more variety than I anticipated. The breakfast coffee is not the best but I might just be picky. Instead of a duvet it was a blanket.. which was a little weird for a hotel, because it wasn't covered by the linen and seemed unhygienic. The bathroom was very big and well equipped. They have an elevator as it's a 3 stories hotel. The breakfast was very good and varied. We could let the luggage there until our flight. The location was on a guite street, not far from the main attractions. Very close to the railway. Narrow elevator. But that’s not a major issue at all. Clean room. Very clean & nice bathroom. Friendly guy at the reception, and a lovely lady who took care of the breakfast section. Good breakfast.